We offer short term and long term storage for your furniture and belongings at our purpose built storage site near Colchester, Essex. Each of our removals vehicles can hold up to five of our specially designed storage containers. Our experienced packers can fill the containers with whatever you need to store. A detailed inventory is taken for each container before they are sealed. Short term storage is ideal if you're not moving into a new property immediately. Your house contents will be secure with us, allowing you to bridge the gap between homes without having to move all your possessions. 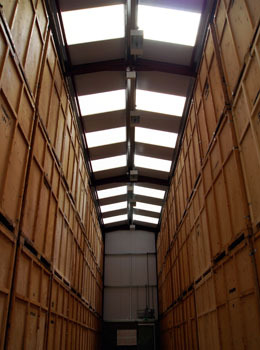 Long term storage is used by a large number of our customers moving abroad for an extended period. Your possessions are handled just the same as short term storage with the containers being sealed by our teams and stored in our secure storage facility. When you require, we will deliver your sealed storage containers to your new home, whether in the UK or further afield.